I have something terrible to admit. 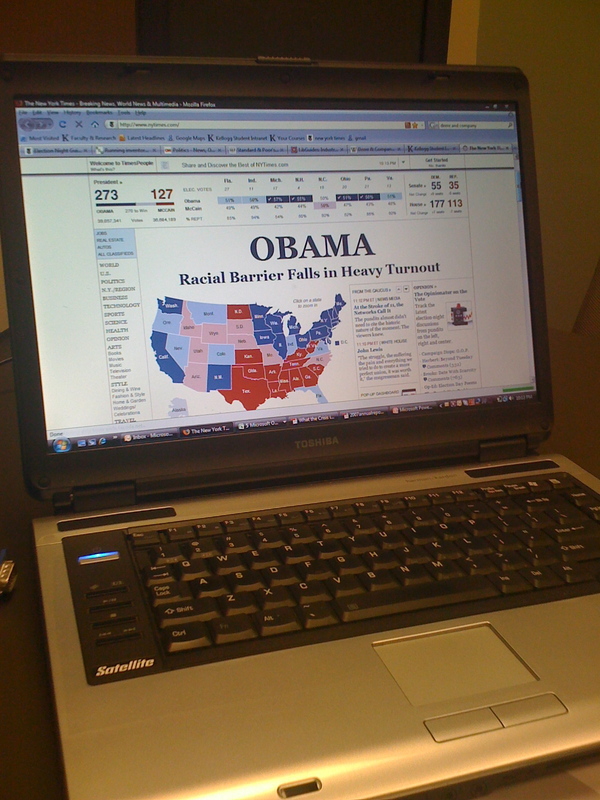 The night that Obama won the 2008 presidential election, I was working on a BCG case competition. And instead of going to Grant Park – just an hour’s train ride from Kellogg’s campus in Evanston – and watching the victorious President-Elect give his acceptance speech, I was sitting in a windowless group room, talking to my Peruvian friend Ben and my Indian friend Sunil about whether or not John Deere should move away from the heavy farm machinery category. This is the photo I took on my iPhone that night. And even though I knew this was a historic night, and even though everything in me wanted to at least get in front of a television to watch the returns come in, I stayed in the 9′ x 12′ room and pondered…tractors. But why the heck did I feel so compelled to choose a potentially career-advancing group meeting over Obama’s acceptance speech? Here’s why: current events are supplanted with other kinds of news when you’re getting your MBA – news of a job offer, news about who our extracurricular clubs are sponsoring to come to campus, news about Tiger Woods’ “extracurriculars,” even news about our classmates’ relationships and broken engagements – and it’s hard to really care about things outside of this. The first black American president was elected. Swine flu captured the Americas. North Korea tested a nuclear weapon. The Conservative Party made gains on the Labour Party in the U.K.
Fidel Castro may have given power to his brother, maybe, sorta. BP spilled a LOT of oil near New Orleans. Did I remember every single one of these events without Googling “major world news 2009 / 2010”? Not a chance. Am I embarrassed? Well, I would be, if I thought that other people were keeping up with the world. But I have a sneaking suspicion that others are more like me than not. Or am I totally off-base here? I totally agree. As bad as it sounds, I really only followed outside bschool news if there was special lunch time discussion about the topic at Jacobs (that didn’t conflict with a group meeting) AND there was a free lunch attached to it that was NOT from papa john’s. Is that bad? Pretty sure I made a special trip to Prairie Moon that night to watch the acceptance speech with other proud citizens. we all stopped drinking for a couple minutes to watch the historic event, maybe almost even shed a tear, then went back to drinking. I also did not get an offer at BCG. @AL – We think you’re the proof in the pudding. But maybe we’re in the minority? Kentaro – Does that mean you do, or do not fall into the category of not caring? We’re not sure.